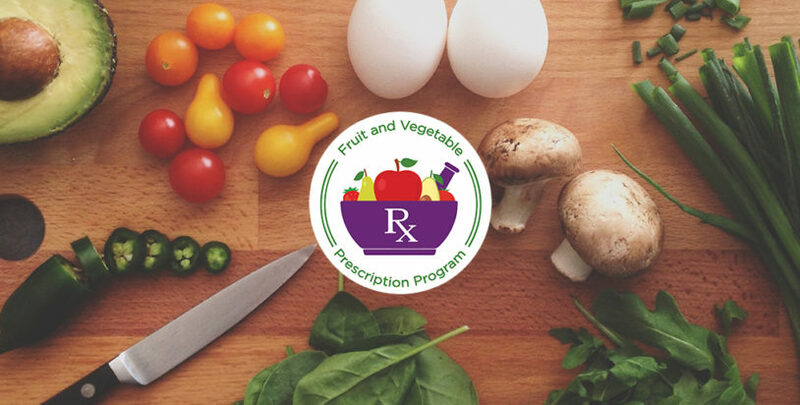 The Shape Up North Fruit and Vegetable Prescription Program is modeled after the evidence based Washtenaw County Public Health Prescription for Health (PFH). Our program works closely with local clinics and nonprofits to build systematic support for healthy behavior changes in patients with chronic disease. The program also creates stronger partnerships between health care providers, patients and their local food sector. The Fruit and Vegetable Prescription Program provides nutritional education, cooking demonstrations and access to healthy fruits and vegetables. Through this program, participants also receive market coupons which are used to purchase fruits and vegetables at the market. To qualify participants must be referred by the clinics and non profits organizations listed below. To see a video on the Fruit and Vegetable Rx program please click below. Participants referred into the program go to their local participating farmers market (see logos above) to check in for cooking demonstrations, nutritional education, tips and tricks to eating healthy. The education is intended to help with selecting and preparing healthy foods purchased at the farmers market. Once participants have completed the session, they will receive market coupons to purchase seedlings, fresh herbs, fruits and vegetables. Coupon values vary based on program. Shape Up North started the Fruit and Vegetable Rx program in 2016 partnering with Munson Family Practice in Traverse City to implement a grant through the Michigan Department of Health & Human Services’ (MDHHS) . The fruit and Vegetable Rx program connected adults with chronic disease who are patients at Munson Family Practice to fresh fruits and vegetables. Eligible participants received prescriptions to redeem at the farmers market held at The Village at Grand Traverse (GT) Commons. The goal was to increase fruit and vegetable intake. The pilot program had 200 referrals who were identified by their provider as having a chronic disease. Participants attended up to 4 cooking demonstrations and nutritional education classes at the market and were eligible to receive up to $100 ( $25 per session) in coupons to purchase fresh fruits and vegetables. Participants attended an average of 4.82 educational sessions. They felt healthier and a statistically significant amount of participants improved their overall health rating to very good. 53% of participants had cut or skipped meals because there was not enough money for food. The average daily fruit and vegetable consumption increased by almost one cup. Participants reported they feel motivated to continue to eat fruits and vegetables daily. In 2017 the program was supported by the MDHHS, the Michigan Health Endowment Fund (Health Fund) and Rotary Charities of Traverse City. Adults in Traverse City with chronic disease were referred from Munson Family Practice and Traverse Health Clinic. The Health Fund supported children who were overweight, obese or food insecure as identified by their Pediatrician. The program also expanded to Benzie County through the support of Rotary Charities. Adults with chronic disease were referred through Bay Area Christian Neighbors, Benzie Senior Resources and the Crystal Lake Clinics in Frankfort and Benzonia. Participants enrolled in the program and then attended nutritional education classes and cooking demonstrations. Adults in the Traverse City program attended 5 session and received $20.00 in coupons per session. Children in Traverse City attended 5 sessions and received $30.00 in coupons per session. Adults in Benzie County attended 4 sessions and received $25.00 in coupons per session. Data from the MDHHS grant was collected and analyzed while the Health Fund and Rotary Charities grants where extended to 2 years and results will be analyzed at the end of the market season in 2018. 15% of participants had never been to a farmers market. 76% attended 5 or more educational sessions. 100% redeemed earned coupons at the market. There was a significant increase in fruit and vegetable variety, consumption and increase of vegetables at main meal. Increased self reported health rating. During the 2018 farmers markets the program expanded to include the Sarah Hardy Market in downtown Traverse City. In partnership with Michigan State University Extension (MSUe), Wednesday mornings are also offered to all adult and pediatric patients in Traverse City. Education and food tastings are provided by MSUe and allow patients and families to enjoy a new market. Participants could also redeem coupons on Saturdays. This past season we added to the above partners to include Northwest Michigan Health Services.